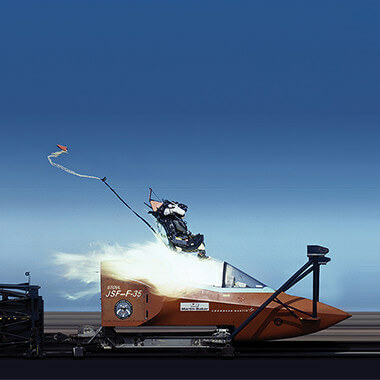 Constantly innovating and pioneering ejection seat development, we’ve dedicated all of our years as a family-run business to saving pilots’ lives. As the world’s leading manufacturer of ejection seats and related equipment, we’re the only company to offer a fully integrated escape system that satisfies the very latest in pilot operational capability and safety standards. Ejection seats are understandably complex: every facet of the safety system must work perfectly to safeguard a precious life, from initiation, escape path clearance, ejection sequencing, stabilisation, life support and parachute descent to final rescue and so much more. We believe that, when an ejection seat may represent a crew member’s last chance to survive, there can be no compromise. As a company, we’ve delivered over 70,000 ejection seats to 93 air forces around the world. Alongside ejection seats, we’ve also developed a range of special crashworthy seats for helicopters and fixed-wing aircraft, currently equipping over 60 helicopter variants. Altogether, we’ve managed to save over 7,500 lives. With facilities around the world, we offer a complete ‘end-to-end service’, from helping the customer establish operational safety and escape requirements to ongoing support throughout the entire service life of the aircraft. Passion for engineering, strong family ties and an extremely loyal and skilful workforce are just a few of the reasons behind our success. Martin-Baker will continuously improve the performance, safety and reliability of its products so all those who use them, do so with 100% confidence. We will focus on meeting all of our customers’ wants and needs and eliminating their frustrations. We aim to earn our customers’ lifetime loyalty and ensure they never have cause to consider an alternative to Martin-Baker. We will provide our customers with best value products and services on-time, with zero quality escapes. We will invest for the long term to advance the capabilities of the people, systems, and processes throughout our organisation and supply chain, so each is best equipped to deliver to our vision. Integrity – Act honestly, ethically and without prejudice in all our dealings with the stakeholders of our business, whether suppliers, employees, customers or shareholders. Understanding – Be sympathetically aware of employees’, suppliers’ and customers’ viewpoints and work to comprehend why they might conflict with our own. Strive to address conflict in a manner which results in an equitable solution for all parties. Professionalism – Always aim to achieve the highest possible standards in everything we do. Work hard to develop the skills to improve standards and set stretching goals. Humility – Understand when we are wrong and why. Use failure positively to learn and address weaknesses to make our products, people and processes better. Accountability – Be prepared to accept responsibility for addressing issues. Highlight problems but work proactively to resolve them. Disclose the results in an open and transparent manner. Teamwork – Work together across functional silos to achieve our mission. Understand the overall business objectives and ensure short term functional targets are consistent with our strategic goals. Never attempt to bring others into disrepute through gossip and rumour. Raise concerns in an open manner and justify them with facts.